Custom Firmware 5.00 M33 has just been released. Dark Alex completely skipped 4.02 and released 5.00 M33. Interested in the changes? Read the PSP 5.00 OFW changes. The most welcome change to 5.00 is the full QUERTY keyboard. No more cellphone like input for us ^_^. Note: If you’ve already install 5.00 M33, you can skip to it’s patches on the next page. The latest patch is 5.00 M33-6. Extract the 5.00 M33 installer files to your computer. Copy the Update folder to X:/PSP/GAME/ on your PSP’s memory stick. Download the official 500.PBP. Rename the EBOOT.PBP to 500.PBP before proceeding. Copy the 500.PBP to the directory; X:/PSP/GAME/UPDATE on your PSP’s memory stick. If you haven’t successfully installed the 5.00 M33 firmware then you can’t proceed here since these are just subsequent patches. Read the guide on How to install 5.00 M33 on your PSP above or if you have official firmware, post a comment and let’s see if I can help you out. If you want to upgrade your 5.00 M33-6 then turn to the next page. hello, im new here ,i have a problem here, can anyone help me to update my psp version 5.00,it says that i need 4.01 ver. but mines 3.90 so i dont how to do and i dont understand much about psp please anyone help me. This is a great tutorial!!! It works great! yo plz help me out. i already have the 5.00 m33-3 (that is my software) on my psp and i want to install it again because i got a new memory stick and i dont no how to install it again so if i download a lower version then 5.00 m33-3 will it screw my psp up, because i really want to download it again and i really want it help me!!!!! you don’t need to reinstall custom firmware on your PSP just because you’ve bought a new memory card. Just copy over ALL files and folders from your old memory card into the new one. hello poh! somebody help me…nadownload ko n poh ung 500-m33 but file corrupted ang nlbas…may mali b ako? err.. you’re not using custom firmware? err inde pedeng install directly ung 5.00 m33 sa ofw. Dapat ipandora/magic MS muna. in the instructions above(well actually a requirement ^^) is it a must that ur current cfw is 4.01 M33? by the way my cfw is only 3.90 m33,is it possible that i can still update my cfw??? ok ok…tnx 4 d advice men..
Hu, im new. but i have my old psp here (the first version) and have the official 5.01 already installed. But now i want costum firmware. how do i do that? and i dont want to mess with that pandora stuff. Create UPDATE folder. paste the EBOOT.PBP and the 500.PBP to that folder. Then put the UPDATE folder in PSP/GAME folder. he says he has official 5.01 firmware installed. the pbp file may have finished downloading before it was complete. Try another link, I’ve posted several of them right? hello again kbayan…nabasa ko ung how 2 downgrade psp…masyado plng mabusisi hehehehe…blak ko snang bumili n lng ng pandora battery at MMS meron b jan s atin s pinas? I successfully upgraded my PSP from 3.90 m33 to 5.00 only and realized I missed the patch m33. Now I want to upgrade again 5.00 to 5 m33-3 but the system wont allow me and gave me ‘The game cannot be started.The data is corrupted’. Please help anyone. can i just click network update and it will work? or will that crash my psp? You can manually update to the official firmware. If you use network update on 4.01 M33, it’ll update you to the latest CFW not OFW. Are you sure it’s a PSP-2000 model, not a 3000? i have a psp slim,i have the original firmware from Sony 5.02 not M33,but i want to change it into 5-00 M33,so what am suposed to do,pleeez help me? soory but its me again,pleeeze i need help with my psp slim its 5.02 i want to change it into 5.00 M33,pleeeze help me? you need to use a Magic MS to install custom firmware on it. I’ll try to create a guide for that in a few days but for now, it’s best if you can ask a friend to help you out. you can upgrade to 5.00 m33 directly. Can anyone assist my PSP is currently running official firmware version 5.02 (model psp-1003). I would like to upgrade to 500m33_4. What do I need to do first before I can upgrade the OFW? Thanks in advance. first off, what model of PSP do you have. Is it a PSP-3000 or a PSP-2000? If it’s the latter, do a check on what model your motherboard is. @sylv3blade, hai silver blade, i read your previous post regarding on how to install the firmware 5.00 M33-3. My model is 2000, when you are ready the guideline, can send to my email? Thx ^^, just another question… I’m Italian… will be any problem or the firmware will work fine with my psp too? yep it’ll work regardless of your PSP’s localization. And yes, you need to install M33 before proceeding to M33-4 since M33-4 is just a patch. Can anyone help I want to put CFW (500m33_4) on my PSP and i’m not sure how to start. My PSP is running Official Firmware 5.02, Model is PSP-1003, MotherBoard is TA-082. Also it’s a phat PSP. Is the 5.00 M33-4 the latest release as of 01-03-09 or is there a newer version? 5.00 M33-4 is the latest release of custom firmware. essa 5,00 M33 CFW não vai travar meu jogos que estão no Ms? Ron´s last entry was: Merry Christmas Everyone! PSP -3000 = no CFW so no downloaded games.. unless it’s from PSN. i have a 3.71 m33 Psp slim and i want to upgrade it to 5.00 m33,shall i just go to Network Update and update it? naghahang ung psp q after q iupdate to 5.00 m33.. is their any risk n msira ung psp pg d2 aq ngupdate or using this site to update my psp? hi there.. will this update not allow me to play games on my memory card??? POPSloader was updated for 5.00, it’s not the firmware’s fault if you didn’t update it. place the extracted folder under /PSP/Game on your memory stick. It’s written on the post. I’VE TRIED DOING THIS ABOUT 6 TIMES AND IT WON’T WORK!!! I HAVE A 3.71 M33-3, I DOWNLOADED THE FILES AND PLACED THEM ON MY MEMORY STICK IN A FILE NAMED UPDATES IN MY GAME FOLDER. BUT WHEN I GO 2 ACCESS IT, IT SAYS CORRUPTED DATA. WHAT AM I DOING WRONG? WHAT DO I NEED TO DO TO GET A 5.00 M33-4 UPGRADE FROM MY 3.71 M33-3?? SOME HELP PLEASE!!! oh, good thing I am curious. Nagreset pala sa normal yung UMD mode. Kailangan i-set sa M33 recovery menu. Thanks anyways, and please do send information kung ano pa yung kailangan kong i-set na ibang bagay para smooth na yung PSP operations ko…salamat. actually there’s nothing more. If you encounter a game with that error again just switch UMD modes. Ok. Thanks a bunch po. Anyways Are you a girl? Curious lang kasi sa avatar. ei syv3rblade, i have psp model PSP-3004 slim lite..i have problem with the custom firm ware of my psp..can you help me please! i already update it into version 5.00..
PSP 3000’s can’t install custom firmware yet. do you have news when it will be release the custom firmware of PSP 3000??? Yeah, nice! But, if you have original software (no customs software like 5.00 m33) yours PSP never Brick!! With hacked versions PSP can stop working after some time! I know what im talking about… You are not SONY that can creates software that never stop working… There always is RISK, isn’t it sylv3rblade???! actually, even just upgrading original firmware there’s a possibility that your PSP will get bricked since you’re still rewriting the firmware. sylv3rblade is right. There’s still possibility that the PSP will brick even when upgrading your original firmware. The “brick” thing doesn’t have anything to do with what firmware you have, but on how you do the upgrade. Since upgrading requires flashing the ROM, any wrong move(like running out of power or accidentally turning off the PSP) will cause the flash process to be interrupted, leaving you with I don’t know, a BRICKED device. So yeah, and it also works that way for other devices, unless you can device a method to flash the ROM again, then things are fixed. WTF? Even the X360 has the “Red Ring of Death”. It’s not the software man, it’s the hardware. So apparently you DON’T know what you’re talking about. Software will work as long as there is a hardware that it is compatible with. I admit though, that moving from OFW to CFW is quite risky, but with technological advancements such as the Pandora battery, the risk is manageable. bkt ayaw gumana ng CWcheats? Thanks man… I have just done the update…. the update is done and hope the games will work…. Im not going to download that version then. I will wait for 6.00 or something. And update if is ther any game that really require that. To many bugs, Updates not working correctly, games not loading… no way! eh?? The 5.00 M33 update is actually working fine if you ask me. If a game isn’t loading after the update then you’re probabably did something wrong. i got my psp-2006 with this firmware already installed. But is it compatible to cwc cheat ? in my case nothing happened after putting the installfolder onto the memory card…. or do i need to degrade my firmware? ?what’s your advice?? 3.80? Not 3.80 M33? Then no you can’t because your PSP has no Custom Firmware on it. i have a psp-1006 loaded with 3.52 M33. Will i be able update after i update to 5.00M33?? Yes you can. Please do try to read the requirements next time. No, you can’t upgrade directly. If you try you’ll end up bricking. You need pandora to install custom firmware. hi i got a psp firmware 4.05 (without any M33’s) can i ask if i can download/install the firmware 5.00m33 directly so i can start playing any downloaded games because curently my psp only accept umd games or game demos atleast can you help me? Hey guys,i am very stupid,i updated my psp to official 5.03, i want to make it 5.00 m33,how can i do that (if possible i prefer without pandora battery or magic stick coz i dont have those) cheers,please help! Can I change the pandora battery to a normal battery? after CFW installing is done. Change it back to a normal battery from the same psp? i want to download this firmware so i can download and play games is this the right firmware and will it stuff up my psp and if i install it on my psp can i uninstall it and how? Ok, So I just picked up a PSP from a friend. Its running on 3.90m33-2. I’m trying to upgrade it to 5.00m33-4, but whenever I try and run the Update from the games Menu, the option provided is to update to 3.73, and the PSP tells me I don’t need to update because I’m at 3.90.
psp 3001 ung meron aq..
phase out na raw 2000.. Yes, they phased out the 2000 the moment PSP 3000 entered production. Malalagyan mo ng firmware ang 3000, kaso di custom, ung official lang. What model of PSP do you have? If you have a PSP-1000 you need a Pandora Battery to install Custom Firmware. If you have a PSP-2000, what motherboard do you have? A shop can check it out for you and install the custom firmware or you can look it up yourself (you need to peek through the UMD door and read the model number on your PSP’s motherboard). You still need a Magic Memory Stick before proceeding. ill check it out thx so muuuuch!!! when i checked my brother’s PSP i saw his M.Board# in the upper right side corner the problem is his psp is the fat one i got the slim and it has limited space i cant find the exact location of its #. sylv3rblade, thanks for posting this update. anyway, i’m trying to install the 5.00 m33 update. i followed your instructions, copied the update folder to the right path and also copied the 500.pbp file in the same folder. but when i run the update, it says “The game could not be started. (80020148)” my console is a psp-2000 and has original firmware 4.05 installed. will i have to downgrade or is there something i’m not doing right? hope you can help me on this. thanks so much for your time! mabuhay! oops, sorry. my psp model is psp-2006. original firmware still at 4.05. To those asking if you can have custom firmware, be sure to read Atma Xplorer’s latest post: Check if you can install CFW on your PSP. huhuhu… thx sylv3rblade for the post..
mine is a slim piano black 2001 series and its more probably in the 2nd Generation 2000 Series that uses TA-088v3. can i have any light that my psp can still be converted… anytime soon? im sooo hoping that you guys and dark alex can spark it up and have a solution for this. ouch, that’s too bad dude. hi sylv3rblade! ian here again can you recomend a reliable shop that you think is best and its location where in they can check out my psp? Circuit City at any SM mall. I have official firmware 5.03 and want to download the 5.00 m33 CFw help me anyone? unfortunately i ddnt know it wld wipe out the modification dat it alrdy had last year to play downloaded games. i found a website http://www.hakopsp.com and tried to ask for help this was my post..
“hi, my sister’s silver psp was modified last year and that it was working fine with downloaded games. it ddnt mess the usual capabilities of the silver psp to display pics, play music & videos, and PLAY UMD games. but wen i tried looking for the downloaded games in the memstick it doesnt display the games i have saved in the memstick. how can i modify it to play downloaded games again? i ddnt know dat if i updated the version with an official updater that it wld wipe out the modified features it had last year to play donwloaded games. its expensive to have it modified again thru a guy who does it at the mall. can i install ur custom firmware to fix the new sony version 5.03 update without messing things up? i alrdy felt bad for messing it wen i updated with a new official sony update by overwriting the old modified state that she paid for to have it done at the guy at the mall who sells psp accessories..
so before she left this morning i let her borrow my blue psp (which i had paid a guy at the mall to modify it) jst for the meantime until i get her silver psp back to playing downloaded games. i want to modify this silver psp but im afraid i might kill d damn thing! you know wat hako replied?!?!? that was so disappointing really. i went back 2d mall and asked for d guy der 2modify it again and he tried to use d pandora battery & his memstick but the thing is it wont start d modifying thing, jst a BLANK BLACK SCREEN. he said he needs to open it up must b somthng wrong w/ memory or something. he said dat wld take longer to fix and wld cost me Php800!!! can i still do the modifying on my own with d help of ur instructions? or shld i let the guy at the mall try to fix it and spend Php800?!?! and it came with d box of DAXTER limited version, my mom bought it there in cali and shipped it to us last year. is there any hope i cld downgrade it again? or shld i jst let d guy at the mall attempt to fix it? If it already had custom firmware installed (and since the Daxter Pack is a PSP Slim) you just need a magic memory stick to install custom firmware. Although since you mentioned that you have little idea of what’s going in, it’s better to cough up the 800 pesos than brick the PSP. re-download the files and try to install again. If the problem persist, post another comment. i cant play my psp. Try entering the recovery menu and do a hard reset on your PSP. If it doesn’t work, you may need a universal unbricker and reinstall custom firmware again. It’s important that you remember that you shouldn’t, under any circumstance, turn off your PSP when patching firmware. Otherwise you’ll brick it. I have official firmware 5.03 on my psp1001 will custom firmware 5.00 m33 work on my psp. If it will how do I got about installing it. Try looking for someone with a pandora battery to help you install custom firmware. i don’t know anyone with a pandora battery. there is only one other person besides myself that I know has a psp and they are running the same official firmware I am and that is my wife. Can’t I buy one some where? You can buy it online or, if some specialty shops. yo, i have 3.71 m33-2 and i was trying to install 5.00 m33-6, when i went t the update it unpacked it then all the sudden it said ( incorrect file ) what did i do wrong? Do we have to install these patches in order or can we just start with 5.00 M33-6 after I install 5.00. After installing 5.00, you can jump to 5.00 M33-6. The other patches are there since I’ve updated the page whenever there’s a new release. i download my psp 3001 v 5.03 piano black can i update my psp to 5.00 m33-6?? Read the requirements, a PSP Brite is still not supported by custom firmware. i used 3.90m33 updated but it stopping in UNpacking…….. i used 3.90m33 to download 5.00m33-6 WHAT SHALL I DO??? HELP!! Hey dude, this works with hacked psp? as with vince, you need a Magic Memory Stick to reinstall custom firmware. I’m currently making a How to install custom firmware on your PSP post so please wait for it. vince i think we both having the same problem any luck to solve the problem…. thanks for your post it really helps a lot. have not used my phat psp for a while now but was looking to install custom firmware onto it. my intention is to play the Final Fantasy Series on the psp. i am currently running official firmware 2.5. just wanted to make sure i go about the right way in installing custom firmware. – my understanding so far is that i need to acquire a Pandora battery and then use it in combination with a magic memory stick which will then install custom firmware to my psp. Could you confirm if this is the best approach coming from official firmware 2.5? Do I definitely need a Pandora battery to install custom firmware (don’t have one at hand)? I can update just fine to 5.0-m33, but if I try to patch it to another revision, the process appears to work, but my PSP boots to a black screen and then doesn’t do anything. I have to use my Pandora to put my system back to 4.01-M33. Any idea what I might be doing wrong? I’m a little confused, do I need a magic memory stick to update my CFW? Or is that just to install CFW in the first place? Yep, you need it if you don’t have CFW yet. If already have CFW installed, just proceed to the installation. Oh okay, I was confused because the thing appeared as corrupted but then I realized it was because of my memory card, not something else. Anyways its updating now, on a diff card. hey i succesfully updated my firmware but had two corrupt data files in my xmb under game is it ok to delete these should i be worried? Yes. If you get an error that you can’t delete the files then it’s probably a problem with the memory stick. Backup your files (save, music, games, themes, plugins) and reformat your memory stick. But before that, did your PSP have 5.50 out of the box or did you update it? Does any of you what is the name of the PDF theme on the picture. Looks really nice. if i install the latest one (5.00 M33-6) and it get wrong, will my psp broken forever? the point is : is it risky? i did all u sad but my doesnt even start the update it says data curopt why is that ??????? do i need any patches for the upgraded psp of mine or they are not nescessary for playing ps1/psx games on the psp?? hi sir,, thnx for guiding us on how to upgrade the psp,, i used to have the 3.80 m33 and when i wanted to play final fantasy 7 of ps1 on the psp it always got stuck at some point…. now its better and i am going further,, however, i sometimes get the same problem as the image stucks and to play it i have to restart the psp,,,,, is there any solution to this problem?? escuse me sir,,, ever since i uopdated the psp to 5.00 m33 i cant play the games i have,, they are the type that u put in the folder ISO,, final fantasy 7 of ps1 is working fine on the psp but the psp iso games arent,, wat can i do to make them both run normaly??? Just wanted to say thanks for this. Worked first time. You forgot to add the 5.00 M33 file on installation which why you ended up with the official firmware. Read up this guide on how to install custom firmware. Hi, Just making sure I have this right….. Installing CFW guide gets me to install OFW 5.03, then I can run Chichen R2, then CFW Enabler then I can install 5.00 M33 followed by the patches?? Does that sound right? I was going to go for GEN-A but if the battery dies then I need to re-install the lot again; is it the same if I put M33 via Checkhen R2? Can you ceck my post 18/7/9 16:27 for me please, just about to try the CFW but am worried that if I put OFW 5.03 (Im currently on OFW 3.71) then Im stuffed for doing the 5.00 M33 not having a pandora battery to downgrade. Nice one!!!! Thanks for all your help sylv3blade. Looks like exactly what I need. Keep up the good work and thanks again. Will report back one Im done. I have a small problem. When I install the update the screen shows “please wait…” for long time. I waited nearly 30 min, still it displays the same…. Try installing a “closer” firmware. I see this problem usually from people jumping from 3.52 5.M33 to 5.00 M33. In your case, I’m thinking your PSP is already a permanent brick. If you can still access the recovery menu (turn off your PSP then turn on while holding the R button) then you can still try to recover it using a Pandora battery. If you can’t however then you need to buy a new PSP. hi… i have psp 5.03 . i downloaded the custom firmware of 5.00 m33 and followed the instructions…and when i went to start the file frm the psp .. its say ” THE GAME CANNOT START , THE DATA IS CORRUPTED” . what should i do know.. please help…. You can’t run 5.00 M33 because it’s a lower firmware version. The error you’re getting is because you don’t have custom firmware on your PSP. Strart reading from How to install custom firmware. I could guide you but it would be faster if you simply read the guide I linked you to. It’ll answer your questions and more. Can you PLEASE tell me how to get out of this? or is my PSP screwed.. If you’ve read the instructions you’ll find that you need to have custom firmware installed before installing 5.00 M33. If you’ve read the instructions you’ll also note that it points you where you need to go to install custom firmware. how do u disable all plugins? i have followed your instructions step by step. i’ve already installed successfully the 5.00 cfw. note: i’ve tried it in every patches listed above. i’ve downloaded them all, and tried them all for several times specially m33-6, but still i can’t install it. Have you placed the installer in the right place? Help Needed! I tried to install a xmb theme and now my sons psp slim freezes at the sony screen. I can still access the M33 recovery screen. Like a noob i did not back up the files it overwrote. How do i fix it? The directions told me to go to the recovery menu, go to advance, go to flash0, the open the VSH folder, open the resorce folder, drag and drop files to folder and yes to overwrite. I should have backed up the files but i thought the directions where very simple. the files it added where : background, gameboot, system plug in.rco, system plugin fg.rco, coldboot.vag, topmenu plugin.rco and itno.pgf Can i copy these files from somewhere and reinstall? They are not on the memory card they are on the psp i belive. You don’t mess with anything in flash0. I’m sorry to say that you have a semi-brick (You can enter flash0 but not the XMB) If you have a pandora battery, you can flash your PSP back to cfw. but when i turn it off or reset, it’s turn to the official firmware. what firmware should i use so that the firmware not gone when i’m turn it off or reset it. There currently is no way for you to permanently add custom firmware to your PSP. Your PSP model doesn’t support it. but it keeps on saying the 500.pbp file is incorrect. it says its verifying 500.pbp then it sayd the file is incorrect. What is your current firmware version? You’re likely to experience this if you’re still on the official firmware. You have custom firmware installed via chickhen. Likely you have a PSP-3000 or a PSP-2000 with TA-088v3 motherboard. If you want to find out what the technician is doing and save yourself some cash by doing it yourself, you can read up the Chickhen installation guide. Currently, there is no way to make your custom firmware permanent due to your PSP’s hardware. I think I have the same in my psp too.. So far we have to get used to it. What I do to keep the custom firmware in my psp is to keep the battery charged and I don’t push my power button too long just the short one. We need to wait a little more to get this fixed I guess. sometimes i cant avoid my psp to turn off. It’s your PSP model and the firmware you have installed on it. Currently there is no work around for this. I did everything as it was written on the guide, and installation was sucessful. I got 5.00 M33, but then a screen appeared saying in various languages that the settings were corrupted. It didn’t seem anything serious because after that I inputed the settings again and everything seemed fine. I didn’t checked if the games were working at the time. Then I installed the 5.00 M33-6 patch. I deleted everything in the UPDATE folder after the major update, and only then pasted the patch eboot along with the 500.pbp, thinking it would be necessary. It installed fine again. I deleted the entire Update folder after this. Then I checked the games. Everything seemed fine again. I chose one and started. Then the problems start: I can’t start any game! It returns me to the XMB with the error 80020321. Only the emulators work! PS: I disabled the plugins too. – I had 4.01 M33-2 before this. – The sound that some games present when your are choosing a game in XMB don’t play. Also, are you sure you’re putting the games in the right folder? The ISO/CSO files should be placed on an ISO folder inside the memory card. what button i press to open M33 vsh menu? well actually I realized that even yesterday! the recovery menu option was set to UMD required! But thank you anyway for answering and for the guide, too. You seem a really cool guy, replying to all the questions. I wish there were more like you! Just one more question: Is this m33 version still the newest? After all this I tried to play Rock Band but the save is corrupted!! I backed them up before updating. I tried to play once but the load failed. Then I replaced the saves in the memory stick by the ones that were backed up just before the update, but it says they are also corrupted! Hmm… I think it’s because Rock Band was released AFTER the official 5.00 firmware was released. Although I’m not sure why your saves are still corrupted even if you copied the saves from before the update. I’ll look into it. Well I do what I can to help out. 😀 I try to answer everyone but I end up getting tired of people asking the very same question by the guy before them >_>. how hard it is to upgrade, relatively to upgrading 5.00 M33? Well, the only feasible reason for me to install GEN-B is if I want to access the PSN. Personally though, I’d stick to 5.00 M33 since it’s more stable. Upgrading to 5.50 GEN-A then GEN-B is simple as pie :D.
It says 3.52 M33. I think you’re still on the official Sony firmware. Alright I have a PSP-1007 and I’ve gotten the chickHEN 5.03 R2 firmware running just fine, it’s the steps after that I’m having trouble with. I’ve tried doing the chickHEN > CFWE 3.50 (nothing happens, PSP just restarts and the firmware is still chickHEN), chickHEN > 5.03 GEN-A (same as previous), and chickHEN > 5.00 M33 (screen just hangs at the ‘Please wait’ step). Thanks for replying. I actually discovered my mistake soon after I posted and used Hellcat’s recovery but ended up bricking my PSP (lol), so I just created a Pandora battery and MMS and I got 5.00 M33-6 working fine. The only downside is a I need a new battery now =\, lol. ouch, well at least you’ve got 5.00 M33 running. I’ve used your guide, and well, I must be a retard or something (in spite of having successfully installed 4.01…), because following it to a tee always seems to result in a semi-brick. I just can’t seem to get my PSP much further than 4.01. Oh well, no worries. Are you already on custom firmware? Please reply with the version of your firmware as you see it on your PSP. I have a PSP 2004 with 3.90 m33-3. Can I directly install 5.00 m33 or do I need to install the intermediate firmwares?? If I have to install the intermediate ones can you please provide me the links to it. One last question: Where do I download the “the official 500.PBP” (as you have stated in the guide)?? Is it the link you have provided?? If you still have no idea how to disable plugins then you’re good to go (this is because your PSP is likely to be clear of plugins). Hi! Im running on 3.9 m33 and decided to upgrade it to 4.01 but i think i got the wrong 401.pbp because it turn out to be a sony official firmware. Can i turn it back to CFW m33. Thanks. Im noob…. You can proceed to follow this guide to installing custom firmware without pandora. i have the 5.03 m33-6 and i most likely have the tav 088 motherboard. and im using cfwenabler 3.60 but i cant seem to enable plugins like cwcheat, anyone can help me out? my PSP is version 5.00.when i download 5.00m33 and put it to my PSP and press install ,then it shows 5.00m33 was corrupted ….. what could i do now? You need your PSP converted to custom firmware before installing 5.00 M33. Read this guide: Install CFW w/o Pandora. what is need to play ISO & CSO file in PSP? I cant see to run the update. it seem to be a corrupted file aft i put it in the game folder. eh. i managed to update to 5.00 le. but now it become official firmware. is dere any solution? Please iterate the steps you’ve done. The instructions are pretty clear though so I’m wondering what went wrong. i install the ofw 5.0. And follow the steps to install chikenR2…but when (in the PSP) i press the Chiken folder ..the PSP was autometicly turn off….and do not start…..
Other problem-when I want to install any PBP file in my PSP …there is a letter box ( this game cannot be started the data is corrupted ) what could i do now? IS THERE ANY WAY TO PLAY ISO,CSO GAME WIHT OUT INSTALL ANY CFW? just updated from 3.71 M33 to 5.00M33-6 without any issues. Thank you for your guide sylv3rblade! I KEEP ON GETTING A MESSAGE SAYING DATE IS CORRUPT. I HAVE FOLLOWED ALL DIRECTIONS AS ABOVE. I AM CURRENTLY USING VERSION 6. How can I fix this problem. version 6? As in 6.00? PSP Phat or PSP Slim with 3.52 M33 or higher. My model is a psp-1002. So Put that software on my PSP then. hey bro I know this may sound farmiliar right. I’m having 4.01 m33-2 & I did exactly everything you said,it says corrupted data.What next ? Can anyone find OFW5.55 anywhere? Just upgraded the CFW from 3.90 m33-2 to 5.00 m33-6. Things went smoothly until I noticed that my saved data games that was created in 3.90 m33-2 (Dissidia and MHFU) can’t be loaded!! It says, “Load failed. The data is corrupted”. Any idea? Help will be appreciated…Great tutorial by the way, thanks! but i did not rename my EBOOT.PBP, i left it and put in the official 500.PBP. it works and i did not get any corrupted data as my old CFW was 3.71 M-33! any1 have questions comment me. Sir, my current firmware version is 3.90 m33-4. Is it alright if I skipped updating to 4.01 m33 and just jump to 5.00 m33? Some people said I still have to upgrade first to 4.01 m33 before install 5.00 m33. And if yes, can I also skip the older patches and just update to 5.00 m33-6 immediately? pare…. pag nirename ko ung eboot.pbp sa 500.pbp…. naooverwrite sya nung 500.pbp na 25mb. Ganun ba talaga un? need mo talaga irename sya as 500.pbp kasi hinde sya mababasa ng PSP. anu b mali q? tnx ng mrmi. will i update 5.00 SONY OFFICIAL not the m33? Does this work on a big fat old PSP 1002 with a 3.71 M33-2? OH NO>>>>its the bloddy Sony one….not M33….wat did u do??????!!!!! my psp screwed up now … i cant play anything downloaded … stupid sony copyrigth crap!!!! Hi, My PSP is running 3.53 M33. I put the eboot and 500 files in as per instructions. Ran the update from the game menu, and it said ‘unpacking data….’ The screen then went black after 3 mins or so and it hasn’t done anything since. Is it supposed to do this ? How long is it meant to take – its been about 10 mins like this now – PLS HELP !!! if i used m33-6 does it mean i also have the changes from m33-2 to m33-5? ah thanks, i have a question, why cant i run the new game ive downloaded, its obscure the aftermath and half-minute hero in my psp. actually its the reason why i’ve upgraded my psp from 3.71 m33-2 to 5.00. i thought it’ll solve my problem, when i try to play the game it says, the game could not be started (80020148). what’s the problem here? Lmao I got it working but my battery aint 78 percent aha. Thanks. I have a PSP running 3.71 M33. I did everything as described, but when I ran the updater it showed the PSP screen, played the sound, and then the PSP turned off. The battery is 100%. Any ideas? do I really need to patch it??? hey guys can anyone help me, i had cfw 3.71 m33-2 and a couple of games worked then i would get the “the game couldnt not be started” error. so i thought would update the cfw to 5.00 m33-6? now the games that use to work dont work. i have no idea wat to do anymore -.- ive tried so much and i have no clue. Have you tried changing your ISO mode? Press and hold select on your XMB and change it to the M33 driver or the Sony one. yes i tried that, i also tried to go into recovery mode and changing the settings through there. i dont know how this happened but i just went to turn my psp on and it wont turn on…i think its bricked. Well the only way to recover that is with the help of a pandora battery. is there any way i can fix it or do i stillneed a new battery? Sounds like a faulty battery to me. Hey, i follow all of your instructions but when i go to my psp xmb and the game section on my memory stick i get corrupted data, what should i do? Does your PSP have custom firmware installed already? yes, i already have custom firmware on my psp and games on my memory stick..
What’s your current firmware version? Technically yes, you’re replacing the official firmware that’s on the flash memory of the PSP to a custom one. Before you hand it over to your friend, what is your PSP model? Rename the Eboot.pbp back to 500.pbp. ok when i run the update for the 5.00m33 it runs it and when it gets to 99% complete it says error contact tech support and gives me this (FFFFFFFE)…..can anyone help me out? i followed all the steps above. sad to say after updating my psp which was on 4.01 m33-2 CFW to 5.00 m33 I can’t find any games on the games memory card nor I can’t update the firmware to m33-6! what did i do wrong? could you guys please help me out. You’re sure your PSP got updated to 5.00 M33 and NOT 5.00? Hi, i own a PSP 2000 running on 3.80 M33-5. i followed the steps on upgrading to 5.00 m33 mentioned above but it does not prompt me to correct idstorage keys or install 5.00 SONY. It stated unpacking… Done and ask to wait. After that the software just restart. And i check the system info it’s still 3.80 m33-5 ver. Any idea why it’s not working for me? Hmm.. do you have any plugins enabled when you installed 5.00 M33? What plugins you mean? Is there anything settings i need to config b4 the upgrading? guys i need help, when i install the v.5.00 to the psp and i went to the games i saw the update psp v.5.00, when i finished updating it my old games are gone even my adhoc file transfer and i can’t open the recovery menu on the psp, what should i do? I’ve mistakenly did such stupid thing. I thought I have to update to 5.00 first before going to 5.00 m33-6, so I update my PSP to 5.00 without including the m33-6 update. When I want to update to 5.00 m33-6, it said “game data is corrupted”. I can’t connect to PSP update either. Err, but my PSP is PSP 2000 (PSP Slim), is it safe to do that? If your PSP has had custom firmware installed (before you updated to 5.00), then yes. If you’re not sure. READ: Is my PSP hackable? recently i just wrongly updated my psp 1001 to official 6.10. can i revert back to custom firmware 5.00 M33? it’s me again my psp model is 2001 or 2000 so i was wondering how to instal custom firmware? # Copy the Update folder to X:/PSP/GAME/ on your PSP’s memory stick. # Download the official 500.PBP. Rename the EBOOT.PBP to 500.PBP before proceeding. # Copy the 500.PBP to the directory; X:/PSP/GAME/UPDATE on your PSP’s memory stick. This doesn’t make sense are we effectivley renaming the eboot file that is already in the update folder or are we replacing it – as renaming it and then copying an identically named filie over it is replacing it…..don’t get this bit as it seems to contradict and may explain why I just get corrupt data message – which file do we actually need in the update folder or are we having 2 named 500.pbp and 500(2).pbp? No, you’re getting the wrong context of the instructions. You’re not going to touch the EBOOT.pbp in the UPDATE folder. The only file you’re going to rename is the EBOOT.pbp from the official 500.PBP zip (the one with 25.8 MB filesize). That 500.pbp I d/l from above – is that not the official one too? i updated to a GEN D 5.50, and wish to change to a m336. however, when i run the m336 installer is says ”the system software of your psp is version 9.90″. is there anyway i can downgrade back to m336? You can’t directly downgrade by using the same way you upgraded your custom firmware. Hi guys i need help, I tried the steps above and was successful in upgrading the 3.71 m33 to 5.00 m33 but when i look at the games in the XMB It’s saying that there are no games.. What did i wrong cause when i try to patch to 5.00 m33-6 the updater wont show in the GAME. How can i fix this, Thanks and Regards…. the problem is my device reboot and the previous cfw(done by fren) is gone. can u direct me on the best cfw that suits my psp. Read this post and follow all instructions to the letter. Does anyone know what I should do. Should i press the O button? 5.50 M33? O_o What is your current firmware version? I used to have a 3.71 m33, have been able to upgrade and downgrade in the past…but after following the instructions above. It became version 5.00…Wad is happening? I cant play iso games anymore. You upgraded to the official firmware, not custom firmware. hi…sorry for bothering…but i really need help..should i update my 3.71 M33-2 to 5.00 M33?? i have a 500.pbp file which is 26472 kb and a eboot.pbp which is 458kb in the folder. I have not put it into the game folder yet..but should i do it?? Plz reply..
You’re not going to touch the EBOOT.pbp that’s already in the folder. The only file you need to rename is the EBOOT.pbp that’s INSIDE the zip file named PSP_500_FW_UPDATE.zip. thx..i updated already..works perfectly..thx alot..
Homebrew games usually works on what version of the psp EG:5.00 M33-2…5.00 M33-3…5.00 M33-4…5.00 M33-5…5.00 M33.6….usually which version can play mostly all of the homebrew games?? hey…Homebrew games usually works on what version of the psp EG:5.00 M33-2…5.00 M33-3…5.00 M33-4…5.00 M33-5…5.00 M33.6…. (and so on)…usually which version can play mostly all of the homebrew games?? Di pede sa PSP-3000 ang 5.00 M33. ano nangyayari twing naguupgrade ka? Hmm.. upgrade ka muna to 4.01 M33 before upgrading to 5.00 M33. Tekken 6 requires that you have 5.50 GEN-B2 or 5.50 GEN-D3 installed. 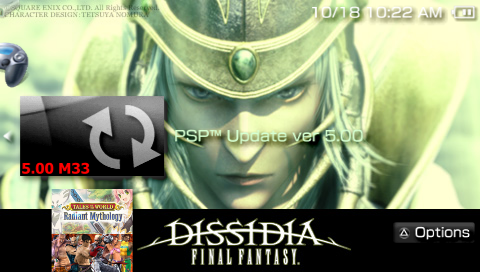 As for Dissidia, your copy is probably corrupted as it only requires 5.00 M33 so just redownload it again. nvm…i try already…still cant work…going dl again…is 5.00m33-6 stable?should i upgrade it to that version?or i just stick with 5.00m33-3? ok, so i installed the 5.00 and it worked. and then i installed the patch -6 and that worked..after that, no other patches work, i get an error saying: “this update or a higher one has already been applied” . i have a game called disgaea 2:dark hope days that gives me the error code: 80020148 saying the came couldn’t be started. If you’ve already installed 5.00 M33-6, then there’s no need to install the other patches. Also, unless your compy of the game is patched, Disgaea 2 only works on 5.50 GEN-D2. What’s your current firmware version? The issue might be that you’re installing 5.00 M33 on a PSP with firmware below 3.71 M33. If you are then installation really takes a long time (and will most likely fail). The solution is to install an incremental update, jump to 4.01 M33 before 5.00 M33. Errr.. you have 5.03 OFW. I have a PSP 2001, With Firmware 5.00 , My psp is completely hackable , I installed it with my pandora battery and rains ultra lite mms maker , I have the 5.00 m33-4 EBOOT.pbp file , but when i load the menu with my pandora battery ( boot it by holding L after inserting my pandora battery and MMS) I select the install 5.00 m33 option , i get error , invalid 500.pbp file . I know there is nothing wrong with the file , i just want to know , why can i not install this ? Can i directly upgrade CFW? If you have at least 3.71 M33, you can but it’s not recommended (too many things can go wrong that’ll lead to you bricking your PSP). ok i got it to work by executing it after i used chickhen and without using the cfwenabler. However, it now just says this “unpacking… done. Please wait…” and it stays like that without doing anything. I’ve tried updating to 5.00m33-2 and 5.00m33-6. Both had the same outcome. Chickhen? CFWE? Are you installing 5.00 M33 on a PSP-3000? I also got then same result…I run 5.00 M33 with 500.pbp but it stop at “Please wait”..
What’s your PSP model and current firmware version? psp 2000 man ung psp ko.. Please read the firmware requirement, it says at least 3.52 M33. Try updating to 3.52 M33 or 3.71 M33 or 4.01 M33 before installing 5.00 M33. okay. I tried upgrading to 3.71 m33 but when i execute the program it says program requires 3.52 m33-3 or higher and im on 3.52 m33-4. why is it no recognizing my firmware ? Any help would be appreciated. my psp current version is 5.03 chickhen R2, i tried to download this version but its daid data is corrupted. do i need to donwgrade? and how? Please check if your PSP is hackable before anything else. Once you’ve determined that, I can point you to the right direction on what firmware to install. I had a psp-2000 running 4.01 m33-2 cfw. I performed the above steps to upgrade to cfw 5.0 m33, but after the installation, it has gone to 5.00 official sony firmware, dunno how that happened!! I had renamed the official firmware file from eboot.pbp to 500.pbp.Did I do anythn wrong over thr? How to revert to my earlier cfw or go to cfw 5.0 m33?? HELP!!!!! Hey, I managed t upgrade my psp custom firware which was 3.71 M33 to 5.00 M33 with your help, and for that I’m very grateful. Even so because it seems I can still play my games without a UMD ^^ sweet stuff!! – At first it wasn’t showing anything when I checked on my PSP on my memory card. So I started getting worried. – Then I decided to change the name of the patch to 500.PBP instead. It came up on my PSP when I checked it out, but as corrupted data. If you’re already on 5.00 M33, you can readily upgrade to 5.50 GEN-D3 without installing 5.00 M33-6. 5.00 M33-6 only patches the bugs that 5.00 M33 contained. sylv3rblade, I really need a point in the right direction, i’m literally stumped here. Don’t know my motherboard type, it’s the old school black-chubby psp. I’ve upgraded the firmware to 5.00 (don’t believe i have m33), I’m trying to simply play bleach heat the soul 6 (no umd). I’ve tried the other steps on various forums links, and keep ending up with “corrupt data” when I rename eboot to 500.pbp. can i have a little help plz? that the file did not pass crc check,or when it start to it says something about a bad heading…. had my buddy at work re-hack, apparently i must have in a drunken stupor done a normal update, and lost the hack cfw. he fixed it back to 5.00 m33-6, in the process of readding my games to the ISO folder now, thanks for the response! can i do this with a psp 3000 without a pandora battery??? Nope. Pandora doesn’t work on PSP-3000s. Once you upgrade over 5.03, it’s game over. * Extract the 5.00 M33 installer files to your computer. * Copy the Update folder to X:/PSP/GAME/ on your PSP’s memory stick. * Download the official 500.PBP. Rename the EBOOT.PBP to 500.PBP before proceeding. * Copy the 500.PBP to the directory; X:/PSP/GAME/UPDATE on your PSP’s memory stick. * After all process is complete, press X. Your PSP will reboot. After shutting down, what is your firmware version? Still 5.00 and not 5.00 M33? how can i find whether my custom firmware version is 3.52 or greater?? For some reason my psp will randomly turn off and on, no matter if my memory card is in or not. i tried different batteries and still the same thing, removed the battery and just used the ac adapter and still nothing…. what can i do to fix my psp 1000 running Cfw 5.00 M33? It could be a bad flash or a hardware problem 🙁 Have a technician check it up. i have OFW 5.03. i can do this correct? or do i have to be lower than OFW 5.00? do i need a pandora battery to do all these process?????????????? The 5.50 GEN-B installation files that you have downloaded is probably corrupted. Try redownloading again. Well since you’re already on 5.50 GEN-A, why not go forward with 5.50 GEN-D3? Hey..i notice that, although i installed gen-A, the psp is showing just 5.50 in system information. Shouldnt it show 5.50 gen-a? I have already installed Custom Firmware 5.50 GEN-3D in my 1000 PSP, but i have to format my memory card due to virus problem. Even i didn’t back up my previous file. Do I need to re install the firmware again?? Right now i download the 5.00 M33 CFW and installed as you have written. But when ever i tried to run that file the message pop up saying that “This game cannot be started. The data is corrupted.” I had download the file twice and tried but still i m getting the same message. Please help me. Right now I have System Software Version 5.50 in my system information. Thank You. How did you install 5.50 GEN-D3 in the first place? By using ChickHen? Either way, you’ll be needing a Pandora Battery to reinstall CFW. The reason you can’t install 5.00 M33 on your PSP is that it’s a lower version (5.00 is lower than 5.50) and you can’t downgrade a PSP without a pandora battery. Initially one of my friend had did that. But now i want to do by myself. So, I downloaded 5.50 GEN-D3 and try to reinstall in my PSP. But mistakenly I have installed “Flash Install OFW 5.50”. After that again i tried to run the 5.50 GEN-D3 then the message pop up saying that his game cannot be started. The data is corrupted. Right now i have got 5.50 Version System Software in my PSP. But I need to reinstall 5.50 GEN-D3. Is this possible without Pandora Battery? Please help me. Do I need to reinstall the Custom Firmware in my PSP in every format of my memory card?? Well you basically installed the official firmware so the only way to get past that is to downgrade using a Pandora battery. Using a Pandora Battery is the ONLY way to install CFW on a PSP once it exceeds 5.03 OFW :(. Also, no, you don’t need to reinstall your cfw when you’re just going to reformat your memory stick. Now what m i supposed to do? What will be the best solution for me so that again i can play my PSP with memory card. Waiting for your reply. Thank You. Hi.I’m new to this PSP thing so excuse me for the stupid question coming up. So here it is , can i install 5.00 M33 on my psp 2004 3.90 m33-3 without risking to brick it? Is there a way I can use Pandora Battery plus the Magic Memory Stick to install the Custom Firmware 5.00 M33? Need mo ng pandora battery to downgrade. If wala, pede ka dumaan sa mga shops na nagooffer ng downgrade. Nasa 500 pesos yung downgrade. tulong nman dian bket corrupted ang cnasabe nung nilagay ko sa psp ?? anong firmware mo ngayon? need mo na may cfw na ung psp mo para iinstall ito. i downloaded everything (5.00 M33 & 500.PBP) and followed all those instructions above, but everytime i run the 5.00 updater, i’m getting the same error message..
i got the installers from the links provided above so i’m pretty sure it’s not the files i downloaded.. i’ve done uninstalling and reinstalling everything for about 10x now, but to no avail..
i have a Pandora PSP Slim 2006, current FW is 5.51 (before it was at 4.31 i think). i have no idea what happened.. please guys, i need your help..
You have updated to the official firmware 5.51, you need a Pandora battery to downgrade and install CFW. Is this too long to unpack? I followed all the instructions above and started the update but it takes too long for it to unpack. what do you think is the problem? Shouldn’t take more than 5 minutes for the whole process. Looks like something went wrong. umm, I did end up downloading the official firmware 🙁 That’s what I had asked. So does this mean I have to make another magic memory stick and borrow my buddy’s Pandora battery in order to download the custom firmware? I want to go back to OFW. How would I go about doing this? I am currently on Gen-d.
when I try I get error reading 500.pbp at root. I have tried for different time, each with the eboot file from a different site, (thinking that I got a corrupt version), no luck. You need a Pandora Battery to downgrade as your PSP won’t allow you to install an update that’s lower in version that your current firmware. Errrmm…. Why does it say that 500PBP is a incorrect file when i run the thing? do u have a pandora battery? umm I currently have cfw 3.71 m33-2 and every time I follow these instructions step by step I end up with a corrupt file I cant run… can anyone help? i also owna psp fat nd it has an official 5.51 sftware can it be hacked?? As for your psp phat, you need a Pandora Battery to downgrade that. how to disable all plugins?? i don’t get it. Go to recovery mode and disable plugins there. hi. i have firmware 3.90 M33-3 on a psp fat can i upgrade to this fw directly??? by doing this will i be able to play metal gear solid peace walker?? Yes, you can upgrade to this firmware directly. To be able to play Peace Walker though, you need to install the prometheus module for this firmware. I had cfw 3.71 m33 installed but then I accidently updated to ofw 5.00 instead of cfw 5.00 m33. Do I still need a Pandora battery to install cfw 5.00 m33? Yes, just download the FW update for 5.00 and not the cfw bit. Err why would you want to go OFW? i have psp phat 1000 i have previously have 3.51 M33, I was able to follow those step and now have 5.0 M33-4. I formatted my mem stick and copied back games and savedata, games are fine but can’t load my savedata, can this be restored? I have a psp 1003 – software version 3.73..
i follow the instruction to download 5.00 M33 and 5.00 PBP. i copy to memory stick. it show corrupted data in psp. what can i do? Heeey mind doing a tut for changing the theme on PSP? Like the one I’m seeing at the picture. Do you know any site offering themes? Wat should I do , if i click X then .the game cannot be started.the data is corrupted? Do you have cfw installed? The installer won’t work on the official firmware. I have 3.71 m33-2 on a phat PSP, done with Pandora’s Battery anout 2 or 3 years ago, can I update straight to this? i have 3.80m33-5 on my fat psp.. can i upgrade to it(5.00m33) ?? Yep, you can install this cfw right away. just had to say THANKS!!! how do i upgrade to 5.00 m33-6..
You’re already running 5.00 M33-6? You can’t downgrade to 5.00 M33 without a pandora battery. Err why downgrade? hey can anybody help me out? i’m using the fat psp update version 5.50 GEN B and i want to update it to 5.50 GEN D3 but every time i follow the steps in the end it shows in the game folder tht the data is corrupted. plz i need help! Can you take a screenshot of the directory containing the XGen updater on your PSP? Hi, currently i got cfw 3.71 m33-4, can i upgrade to 5.00 m33 without upgrading to 4.01 first? i downloaded the 500.PBP and then extracted that other thing i was supposed to dl. i copied the small UPDATE folder to psp/game and there was a file inside the update folder called EBOOT.PBP i renamed it to 500.PBP and WHAT THE HELL NOW?!? the other file is 500.PBP too and windows wont let me have two with the same name in one folder! what am i supposed to do? Can someone help me? I have a phat running 3.52 M33 (bought used). Trying to upgrade following these instructions, did everything as stated, but when I go to run the 5.00 update (the logo to the left does say 5.00 m33), I just get a black screen with no activity…can someone help out? Help…When I try to start the CFW it says that the data is corrupted. What should I do?